On Saturday I spent the day at Edinburgh Zoo. It was a great day out and we definitely hit lucky for the weather! Apart from one shower, the day remained dry and pleasantly warm. I know you are thinking what does this have to do with cruise? Well, as you will know many cruise ships visit Scotland every year, Leith and Rosyth being the ports for visits to Edinburgh. I thought I would share my day because it would make for a pretty awesome cruise excursion. I told you I manage to make EVERYTHING relate to cruising! We pre-booked our tickets online because we wanted to view the Giant Panda’s. You can only see these animals with a pre-booked time slot, remember that or you will miss out on a great experience! You print a simple ticket online and that’s it, all done. 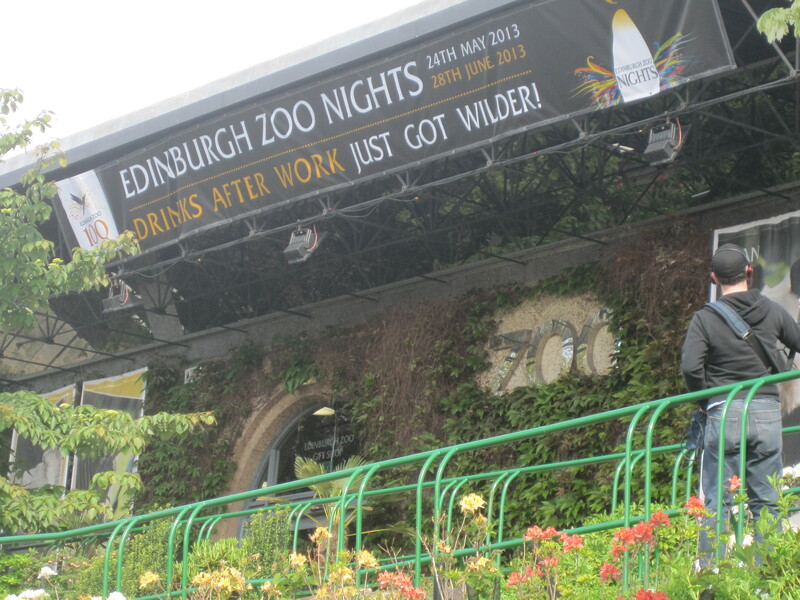 The zoo is just outside the city centre, I was actually quite surprised by its location to be honest. I expected it to be out in the wilderness but no, it’s on a busy residential street. 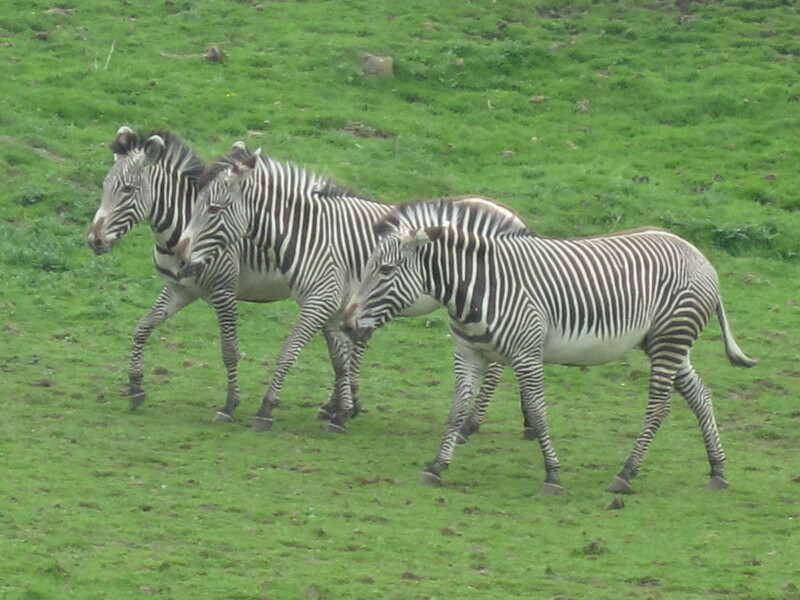 We took a taxi from Edinburgh Waverly train station to get to the zoo (cost of the taxi was £10.75) but on the way back we used the local bus service. There are numerous buses you can take. The numbers 26 and 100 go past the zoo every few minutes and pick up at stops all over the city centre, it took roughly 20 minutes to get back to Prince’s Street and cost £1.50 each, that’s about $2.30 for my American friends. The city sightseeing buses also go past the zoo so that could be another option if you had an extensive period of time in port, you can hop on and hop off wherever you like. As we had pre-booked tickets we didn’t need to wait in a queue at the entrance, we were given maps and waved straight through. The zoo was busy, but not crowded, it didn’t feel like you were battling to see the animals. We started with the various species of Monkeys and Birds then made our way passed some Warthogs and to the Penguins Rock area. I loved the penguins. They were very inquisitive and not afraid at all to come right up to the barrier that separated you from them. They show-case a Penguin March too every day at the zoo. We missed this but I am told it’s pretty impressive to watch. Our next stop was Tian Tian and Yang Guang, the Giant Panda’s. The panda visit is as I said scheduled. You must have a pre-booked time slot but even with this they can only let 50 people in at any one time so you may still end up waiting a little beyond the time on your ticket. We viewed Tian Tian first and what an animal! She was huge but fast asleep. It was actually quite nice because she looked so cute and cuddly, her little face almost smiling as she enjoyed what must have been the deepest sleep in history. Yang Guang was next, he is a lot bigger than Tian Tian, or so we were told. 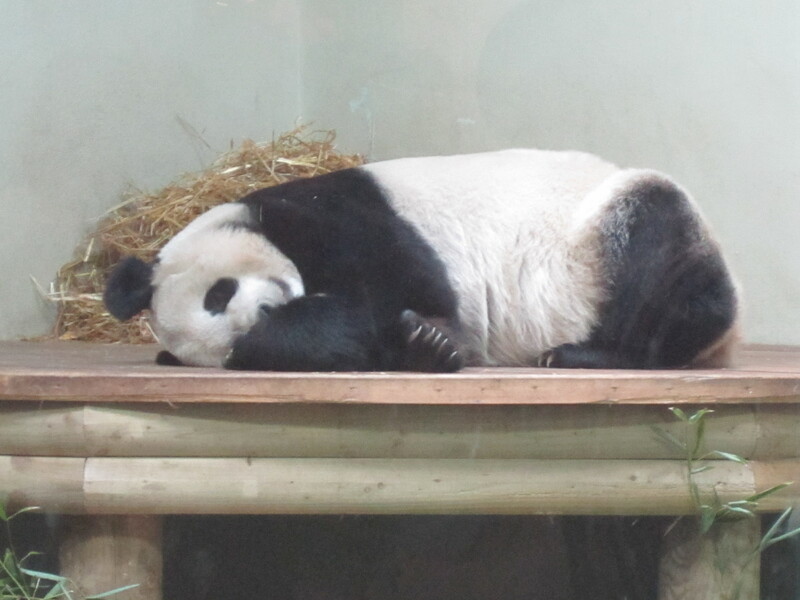 The lazy boy was too busy laying down eating his bamboo so the most we got to see of him was an arm and paw. The Zoo is currently waiting to find out if Tian Tian is pregnant. Fingers crossed there’s a cub soon! We stopped at the Jungle Café for some lunch after the Panda’s and let my Godson enjoy the park. There were a lot of little climbing frames and parks all over the zoo. Great to let the kids play whilst you take five minutes to rest your feet, and rest you will need too. The zoo is up-hill, and coming back down can be pretty steep. You really need a comfortable pair of shoes and to keep hydrated. If you can’t manage the walk they do run a safari bus through the park but there only seem to be two stops. If you think it will be easier for you to go down rather than up I suggest you get the bus from the park entrance all the way to the top and work your way back down from there. Once refuelled and re-hydrated we moved on to the One-Horned Rhino, Sun Bears, Zebra’s, Asiatic Lion (Male and a Female) Pygmy Hippo, Capuchin Monkey’s, Wild Cats and Chimpanzees. There were many other animals of course, too many to list. Sadly the Koala enclosure is closed until early summer so we missed out on these and the Tiger was nowhere to be seen. Clearly hiding very well in his enclosure or he had been moved. Aside from these two small disappointments we had a great day out and my Godson loved it. He was very apprehensive when it came to getting close to the enclosures at first, but he did get more comfortable as the day went on. I can’t blame him to be honest, even I was a little taken back when I found myself within 2 feet of a male lion with the bones of a rather large animal at its feet. Re-enforced glass or not he is still King of the Jungle! 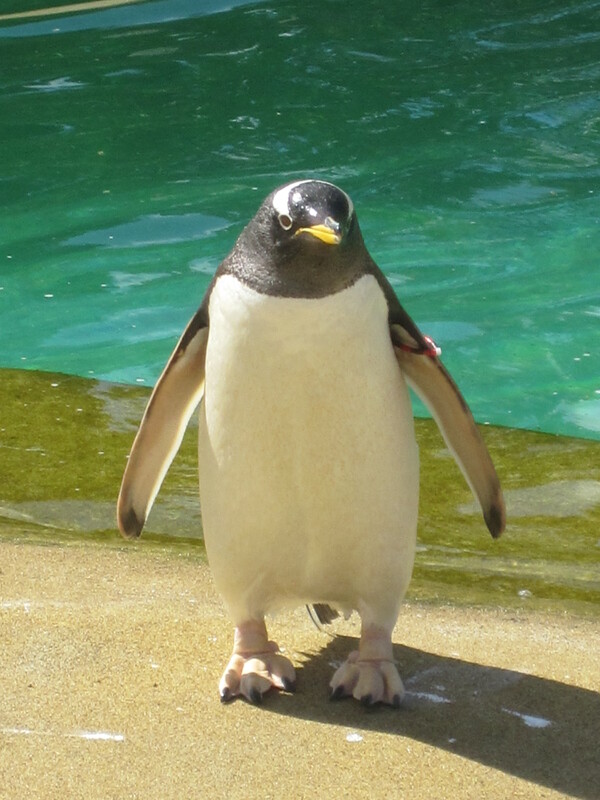 Although the closest port’s for Edinburgh Zoo are Leith and Rosyth you can still comfortably access the zoo from many other Scottish ports and even from as far away as Port of Tyne in North East England. 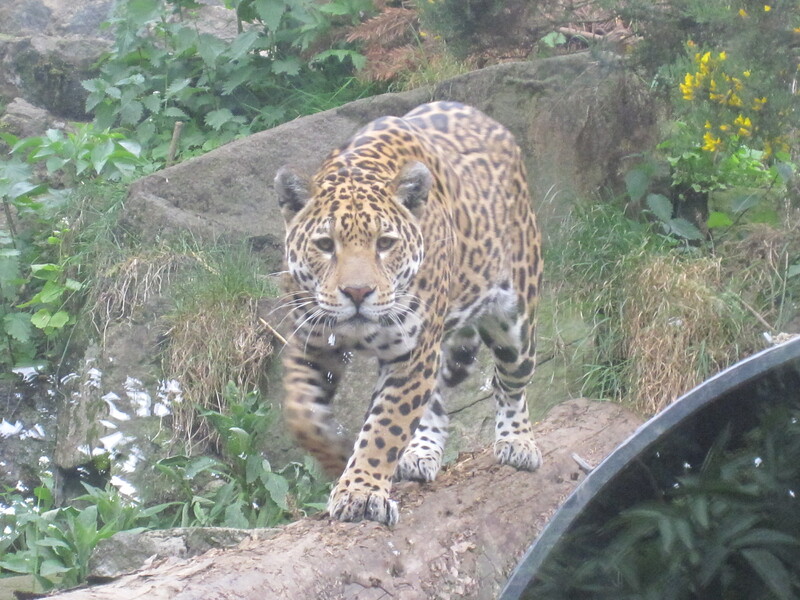 If you don’t find an excursion option for the zoo through the cruise line then think about it as a DIY option if you are looking for something a little different that’s a break from sightseeing and/or shopping. Just remember to always allow yourself plenty of time, you don’t want to miss the ship!